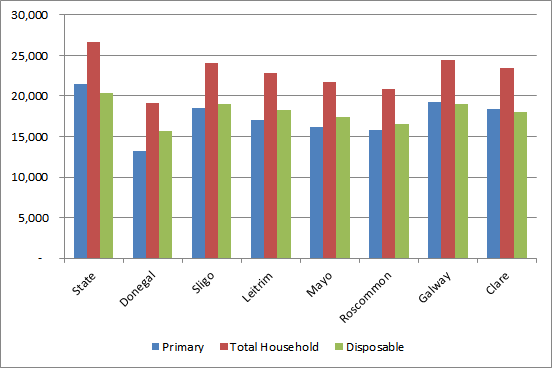 The CSO has recently published data on Household Disposable Incomes at county level as part of the ‘County Incomes and Regional GDP 2016’ release. This release contains useful trend data on incomes for counties as well as information about the levels of different household income components for each county. Data on regional GDP, which is also part of this release, will be considered in a future post. The map from the CSO below gives a quick overview of Household Disposable Income per person in 2016. It shows, unsurprisingly, that the highest disposable incomes are in the east and south, while counties in the west and north have the lowest disposable incomes. 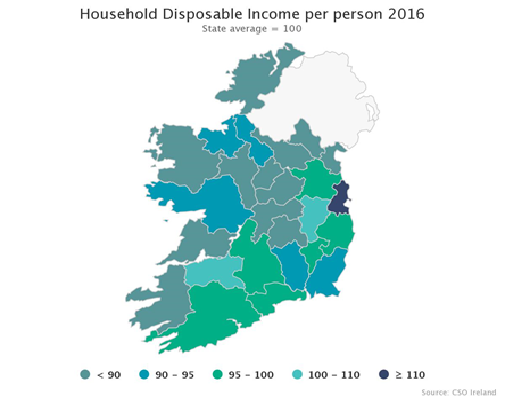 Dublin, Limerick and Kildare are the only counties where per capita disposable income exceeded the state average in 2016 although Wicklow, Cork and Waterford, were just below (see Figure 2below for more detail). A summary of key data for the Western Region is provided in Table 1 below. The data for 2016 can be regarded as more robust than the 2017 estimates and so it is used for most of the comparisons in this post. In 2016 Disposable income per person in the Western Region was €17,934 and in 2017 it had increased to €18,128 (I have calculated the Western Region figures using inferred population estimates). Disposable income per person in Donegal is consistently the lowest in the region (and nationally) and estimates for 2017 show a small decline (-0.6%) in incomes in Donegal between the two years. Disposable Incomes in Donegal in 2016 were only 77% of the state average. 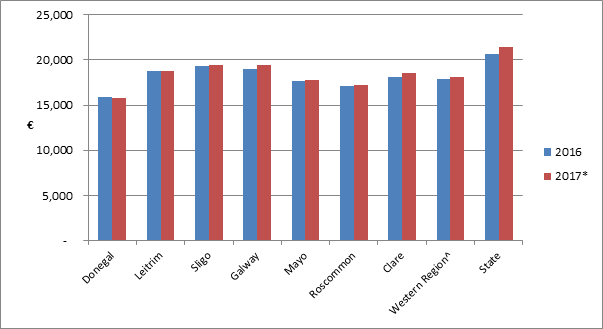 Only three Western Region counties (Sligo, Galway and Leitrim) had disposable incomes of more than 90% of the state average, while Clare had a disposable income of 88% of the state average, Mayo 86% and Roscommon 83%. The Western Region as a whole had a disposable income per person of 87% of the state average in 2016. The small changes in disposable incomes between 2016 and the 2017 estimates are shown in Figure 1 below. 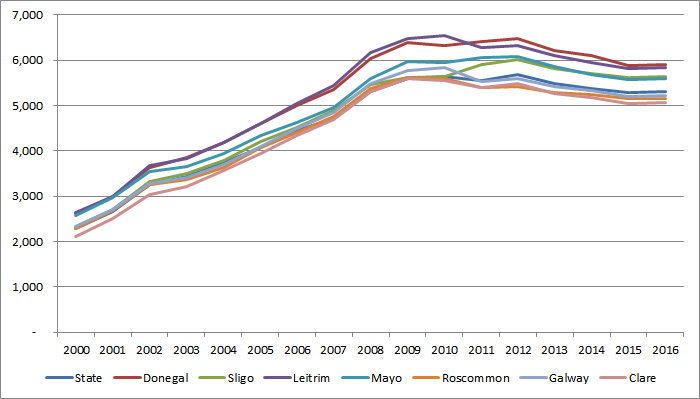 As noted, there was a decline in Donegal, and in Leitrim, Mayo and Roscommon the growth was less than 1%. The most significant growth between 2016 and 2017 was in Clare (2.4%). For the Western Region as a whole, disposable incomes showed a growth of 1.1%. Disposable income per person in the State was €20,638 in 2016 and is estimated to have grown by 3.7% to €21,397 in 2017. As noted, however, the 2017 data is estimated. All counties showed more significant growth in Disposable Incomes between 2015 and 2016 (Table 1 above). The largest growth in the region that period was in Mayo (4.6%) and Roscommon (4.4%). Disposable income per person for all Irish counties is shown in Figure 2 below. Disposable income per person in Donegal is lowest in the state, and it is third lowest in Roscommon (Offaly is second lowest). In contrast, Sligo has the tenth highest disposable income per person, and Galway is in eleventh place. 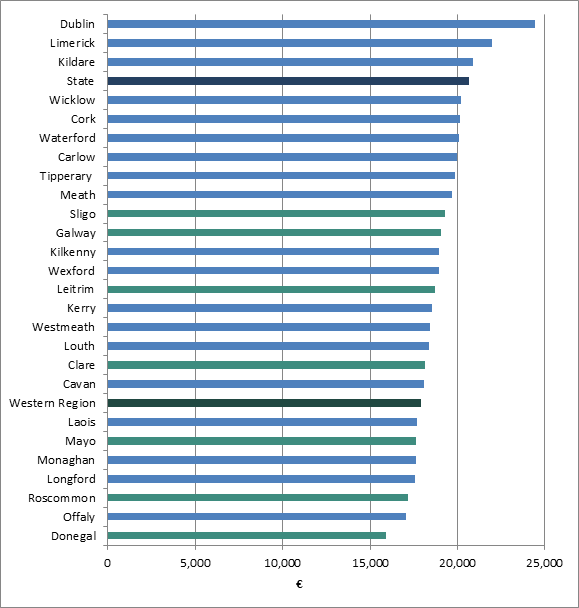 The highest disposable incomes nationally are in Dublin, Limerick and Kildare. These, along with Wicklow, Cork and Waterford, all have Disposable Income per person of more than €20,000 per annum. Figure 2: Disposable Income per Person for all Counties, Western Region and State. It is also interesting to look at changes in disposable incomes over time. Figure 3 shows trends in disposable incomes in the Western Region between 2000 and 2016. All of the counties show a very similar growth trajectory with rapid growth to the 2008 peak followed by rapid decline. There was a small peak in 2012 followed by a fall in 2013 which related to a decline in social transfers as discussed here. This decline between 2012 and 2013 which occurred in all counties, has mostly been followed by a period of growth to 2016. While Figure 3 shows the actual Disposable Incomes per person, when considering the trends among counties it is helpful to use indices so that county figures can be examined relative to the State (State=100). Thus Figure 4 provides a contrast to the more positive growth trend indicated above in Figure 3 which showed growth in disposable incomes in Western Region counties between 2013 and 2016. Growth rates in the Western Region were lower than for the state as a whole and so Figure 4 shows that Disposable Incomes in Western Region counties are declining relative to the state average (although there is some recovery relative to the State indicated between 2015 and 2016). 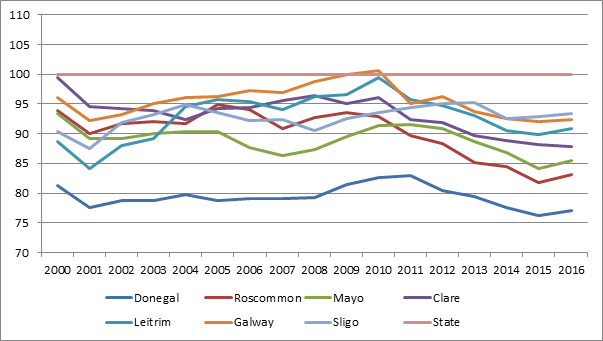 Figure 4 also reminds us that Galway was the only Western Region to have had a Disposable Income of higher than the state average during this period and this was only for one year in 2010. Given the significance of the peak in Disposable Incomes in 2008 it is interesting to examine how Disposable Incomes performed in 2016 relative to that peak. Although there has been some recovery in Disposable Income since their lowest point in 2013, Disposable Income per person in 2016 was below that for 2008 in all of the counties in Ireland (Figure 5). Indeed for seven of the counties Disposable income was over than €4,000 per person less in 2016 than it had been in 2008. Two of these counties (Roscommon and Clare) are in the Western Region. 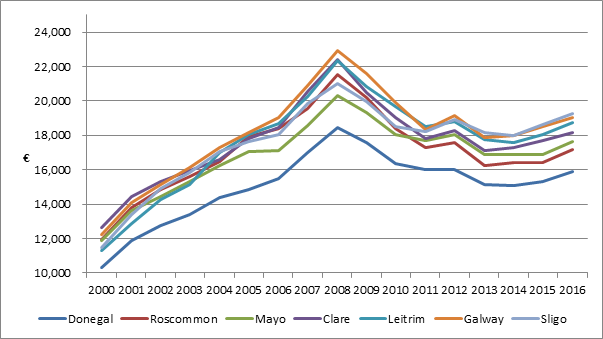 As was shown in Table 1 above Disposable Income in 2016 was more than 20% lower in Roscommon (€4,401) in 2016 than it had been in 2008, while in Clare it was more than 19.1% less (€4,277). Most significantly, in Meath incomes were €5,544 higher in 2008 than in 2016. In contrast, Limerick is the county showing least difference in disposable income per person in 2008 compared with 2016 (- €321). 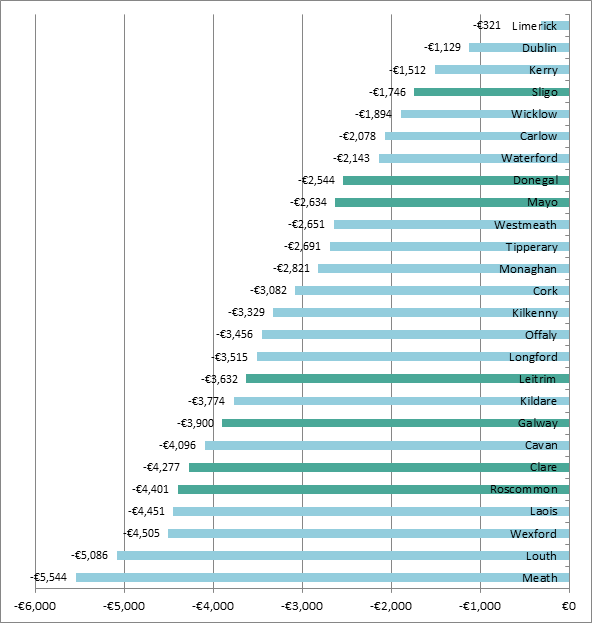 Dublin and Kerry have also recovered relatively well, although there is still a significant difference between Disposable Incomes in these counties in 2016 and 2008. 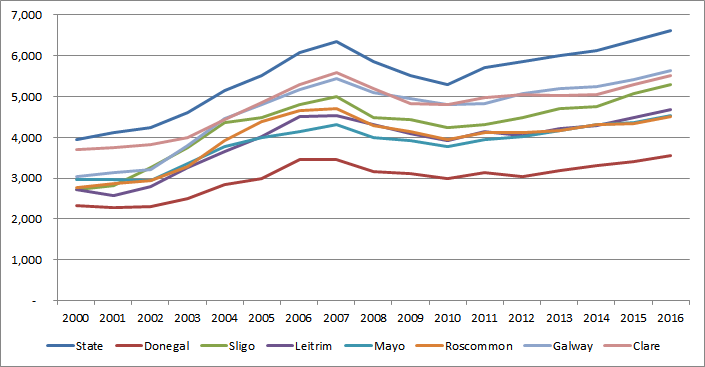 Of the Western Region counties Sligo has recovered best, with disposable incomes only 8% below that in 2008 (€1,746). 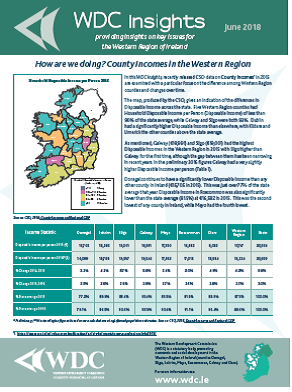 Interestingly, Donegal (14% less) and Mayo (13%), which are among the Western Region counties with the lowest Disposable Incomes per person, also show a less significant gap to 2008 than other Western Region counties. However, it is of concern that disposable incomes in all counties are still considerably lower than they were in 2008. While the Irish economy has recovered well in the last few years, this has not fed through to disposable incomes as measured in this data. The differences in disposable incomes among counties can be explained by the changing patterns in the components of household incomes (as was discussed here and here). I will examine trends in these in the most recent data on income components in a future post. 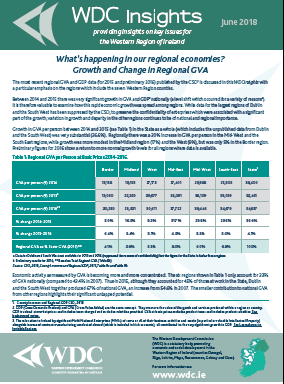 The growth and change in the regional economies as shown by the Regional GVA data will also be examined in a future post. Regional GDP for 2017 has recently been published by Eurostat for 281 NUTS2 regions in the EU28. This data shows how the different EU regions compare in terms of GDP and how they rank in relation to each other and to the EU average. This data is of particular interest in Ireland as it is the first data on regional GDP available for the new Irish NUTS 2 regions. As discussed here and here, instead of two NUTS2 regions in Ireland (the Border, Midland and West (BMW) Region and the Southern and Eastern (S&E) Region) there are now three regions: Northern and Western, Southern, and Eastern and Midland. The Northern and Western region is very similar to the Western Region under the remit of the WDC. While this is the first GDP data available for the three regions it is expected that the CSO will shortly publish regional GDP data in Ireland for the same years, at both NUTS2 and NUTS3 level, though there may be some issues relating to confidentiality at NUTS3 level which could delay the publication. Regional GDP over the last decade. Eurostat has published the data for 2006 to 2017 (although for Ireland the 2017 data is an estimate) allowing for a good examination of the changing output of the three regions, as measured by GDP. 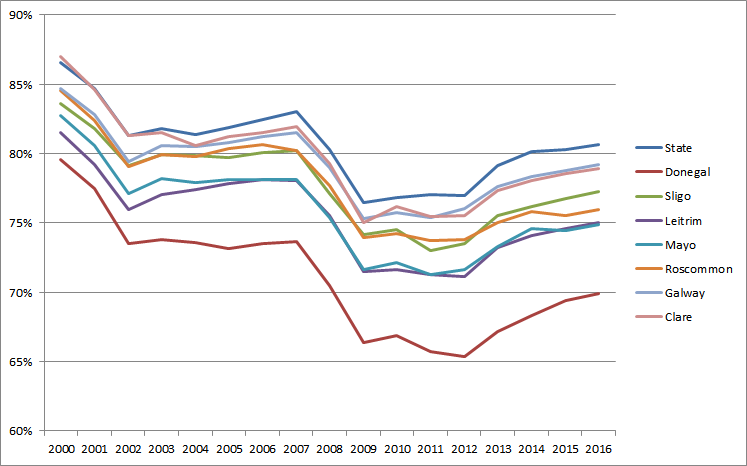 Figure 1 below shows regional GDP (€million) in three NUTS2 regions for that period, highlighting the very different growth trends in the regions in the last decade. In 2006 the Northern and Western region accounted for 12% of the national economy, but by 2017 it was estimated to account for only 8%. GDP in the region had grown by only 5% in that period. In contrast the Eastern and Midland region economy grew by 47% between 2006 and 2017, while the Southern region’s economy had more than doubled in size (101% growth). The Irish economy as a whole, as measured here, grew by 59% over that time. The Eastern and Midland has the largest regional economy, accounting for 56% of the national economy in 2006. This fell to 51% in 2017. The Southern region accounted for 32% of the economy in 2006 and 41% by 2017. The level shift in the size of the economy Ireland in 2015 discussed in detail here, is shown clearly in the chart. The relocation to Ireland by significant Multi National Enterprises (MNEs) of some or all of their business activities and assets (in particular valuable Intellectual Property) alongside increased contract manufacturing conducted abroad (which is included in Irish accounts), all contributed to this shift in GDP. It is evident that the most significant shift was experienced in the Southern region, previously with the Southern and Eastern regional data combined this was less obvious. Nonetheless growth in the Eastern and Midland region from 2013 onward was also very significant while the Northern and Western region GDP does not appear to have been affected by the factors which gave rise to the level shift, or to have achieved steady economic growth. While Figure 1 shows the actual GDP, Figure 2 below shows GDP per person in each of the regions, a format which is more comparable across regions within Ireland and Europe and highlights the very significant widening of disparity among Ireland’s regions. It should be noted that Figure 2 shows the data from 2006 to 2017 in terms of in terms of purchasing power standards (PPS) rather than euro. The disparity in GDP per person has grown significantly since 2006. In 2006 GDP (PPS per inhabitant) in the Northern and Western region was 69% of the national average, by 2017 it was only 46%. Meanwhile, in 2006 in the Eastern and Midland region GDP per person was 115% of the national average and 104% in 2017. The most rapid change has been in the Southern region where GDP per person was 95% of the state average in 2006 and 122% in 2017. Data for 2017 was also provided in euros. The GDP per person in 2017 for the Northern and Western region was €28,400, for the Southern region it was €74,700 (163% higher), for the Eastern and Midland it was €64,000 per person, 125% higher than the Northern and Western region. Nationally GDP was €61,200 per person. The GDP per person in the Southern region is 3rd highest (63,000 PPS) of the 323 regions for which there is NUTS2 regional GDP 2016 data, after Inner London West (185,100 PPS) and Luxembourg (76,200 PPS). The Eastern and Midland region is 8th (54,000 PPS) while the Northern and Western Region lags considerably, in 181st place (23,900 PPS). more developed regions (where GDP per inhabitant was more than 90% of the EU average). For the programming period 2021-2027, the Commission envisages the continued use of the NUTS classification for determining the regional eligibility for support from the ERDF and the ESF. In the Southern region in 2017 GDP was 220% of the EU28 average (see Figure 3 below) and the Eastern and Midland region GDP was 189% of the EU average neither region would qualify for the ERDF or the ESP. The Northern and Western Region, however, had a GDP of 82% of the EU average in 2016. It was more than 90% of the EU average in only two of the last ten years (2011 and 2012), although in 2006 it was greater than the EU average at 102%. It is estimated at 84% of the EU average in 2017 and so it seems likely that the Northern and Western Region will qualify as a ‘transition’ region in the programming period 2021-2027. There are of course difficulties with the use of GDP as a measure of regional disparities and regional well being (see here and here) but despite these concerns it remains the most important statistic for regional economic activity. It is essential to our understanding of the changes taking place in Irish regions, although, in order to fully understand regional growth and change, it is important to use GDP in combination with other data such as that on employment, enterprise activity, income, wealth and consumption. The rapid growth in GDP in the Southern Region and in the Eastern and Midland regions contrasts sharply with the very significantly slower growth in the Northern and Western Region. The substantial differences in regional GDP per person in 2017 in the three regions, when compared to that in 2006, should be of great concern for Ireland as a whole and for the Northern and Western Region in particular. The WDC remit covers Donegal, Sligo, Leitrim, Roscommon, Mayo, Galway and Clare. The Northern and Western region is similar, but includes Cavan and Monaghan and excludes Clare (which is part of the Southern Region). PPS is the technical term used by Eurostat for the common currency in which national accounts aggregates are expressed when adjusted for price level differences using PPPs. Basic figures are expressed in PPS, i.e. a common currency that eliminates the differences in price levels between countries allowing meaningful volume comparisons of GDP between countries. In August the Department of Business, Enterprise & Innovation published the Annual Employment Survey (AES) for 2017. This provides an analysis of employment in Industrial and Services companies under the remit of IDA Ireland, Enterprise Ireland and Údarás na Gaeltachta. This type of employment is referred to as ‘agency-assisted’. In 2017, total permanent, full-time employment (PFT) in agency-assisted companies in Ireland was 379,810. This was an increase of 19,369 jobs (5.4%) on 2016, continuing the growth trend in evidence since 2011. Part-time, temporary or contract employment in agency-assisted firms also increased by 1,796 jobs in 2017 and now stands at 48,221, the highest number recorded in the 10-year period. Combining PFT and Temporary/Part-time jobs brings total agency-assisted employment in Ireland to 428,031 in 2017. This was 19.5% of total employment in the country in that year (average employment of 2,194,150 across the year, based on CSO’s Labour Force Survey). The AES data includes a detailed regional breakdown of agency-assisted employment by employment type and ownership in Appendix B. We will begin by looking at the three larger regions of the Border, Midlands & West (BMW), South & East and Dublin. All three initially experienced declines in assisted employment but have shown strong recovery since 2012 (Fig. 1). The South & East region has consistently been the largest, though in recent years as Dublin has grown more rapidly it has narrowed the gap somewhat. Meanwhile the gap between the BMW region and the others has widened in recent years. Fig. 1: Total agency-assisted employment in BMW, South & East and Dublin regions, 2008-2017. Source: DBEI, Annual Employment Survey 2017, Appendix B. To consider this in more detail, we’ll look at the BMW’s share of total agency-assisted employment in the State. The BMW region’s share has followed a downward trend across all types of ownership (Fig. 2). For Irish-owned employment, its share fell from 27.1% in 2008 to 25.6% in 2017. While for foreign-owned agency supported jobs, its share fell from 19.2% to 18.9% over the 10-year period though it was higher during 2011-2014. The region has consistently accounted for a higher share of all Irish-owned employment than of foreign-owned. Fig. 2: BMW region’s share of total national agency-assisted employment, 2008-2017. Source: DBEI, Annual Employment Survey 2017, Appendix B. At the more detailed regional level (Fig. 3) the share of total agency-assisted employment in each region changed between 2008 and 2017. Dublin’s share of total assisted jobs grew steadily from 34.4% in 2008 up to 37.6% in 2017. The second largest region is the South West and its share also grew from 14.8% to 16.3%. While the South East was third largest in 2008, by 2017 the West had moved into third position, with the South East dropping to fifth. Only three regions – Dublin, South West and West – had a higher share of total employment in 2017 than in 2008. Fig. 3: Percentage of total national agency-assisted employment in each region, 2008, 2012 and 2017. Source: DBEI, Annual Employment Survey 2017, Appendix B. While the share of total assisted employment located in several regions declined, all regions experienced growth in their actual number of agency-assisted jobs between 2008 and 2017 (Fig. 4). Clearly the South West (36.3%), Dublin (34.6%) and West (27%) (influenced by Cork, Dublin and Galway cities) had very strong growth over the 10-year period, with the South East (5.1%) and Mid-East (7%) performing least well. This helps to explain their deteriorating relative positions. Looking at the most recent performance (2016-2017), Dublin, the Mid-West and South East had the strongest growth, up 6.2% in the year. While most other regions had growth of around 5% the Mid-East actually saw a decline in agency-assisted employment in the year. Fig. 4: Percentage change in total agency-assisted employment in each region, 2008-2017 and 2016-2017. Source: DBEI, Annual Employment Survey 2017, Appendix B. Data is provided on two types of employment – Permanent, full-time and Temporary, part-time or contract employment (referred to as ‘Other’). The percentage of total employment that is ‘Other’ has generally increased over the 10-year period, though with considerable volatility. Nationally 11.3% of total employment in 2017 is ‘Other’ compared with 9.1% in 2008. At 13.4% the West region has the highest share of Temporary/Part-time/Contract employment in 2017 and the share has been increasing since 2015. In Dublin however, which has the next highest share (12% in 2017), it has been declining (Fig. 5). At 8.9% the Mid-East has the smallest share of ‘Other’ employment. Fig. 5: Percentage of total agency-assisted employment that is temporary, part-time or contract employment in each region, 2008-2017. Source: DBEI, Annual Employment Survey 2017, Appendix B. The balance between foreign and Irish-owned agency assisted employment differs substantially at regional level (Fig. 6). The three regions with the largest number of agency-assisted jobs, and also the strongest growth during 2008-2017 (South West, West and Dublin) have the highest shares of foreign-owned employment at over 57% in 2017. The Mid-West is the other region where the majority of assisted jobs are foreign-owned. The Midlands and Border regions have the lowest shares of foreign-owned employment and therefore the largest shares of Irish-owned employment. Two-thirds of assisted jobs are in Irish companies. Fig. 6: Percentage of total agency-assisted employment in foreign-owned and Irish-owned firms in each region, 2017. Source: DBEI, Annual Employment Survey 2017, Appendix B. Fig. 7 shows that over the 10-year period, the South West, Dublin and West all had 40+% growth in agency-assisted foreign-owned jobs. At 21.5% the Border also had strong growth in such jobs, though from a lower base. In contrast, the Mid-East and Midlands both experienced a fall in foreign-owned assisted employment. It should be noted that some of the changes in job numbers by ownership may be due to a transfer of ownership e.g. an Irish company bought by a foreign company or a foreign company becoming an Irish company through a management buy-out etc. When a company changes ownership, jobs in that company are re-classified as Irish or foreign and the changes back-dated to previous years. Irish-owned assisted jobs grew across all regions during 2008-2017, most strongly in the Mid-East somewhat compensating for declining foreign-owned employment. The South West, Dublin and Midlands also had around 20% growth in Irish-owned assisted jobs with the South East and Border regions performing worst. Irish-owned assisted employment out-performed foreign-owned in three regions (Mid-East, Midlands and Mid-West). In the case of the West, growth in foreign-owned assisted jobs was over three times greater than growth in Irish-owned assisted jobs, in Dublin and the South West it was about double. Fig. 7: Percentage change in total agency-assisted employment in foreign-owned and Irish-owned firms in each region, 2008-2017. Source: DBEI, Annual Employment Survey 2017, Appendix B. Over the past year (Fig. 8), all regions experienced growth in both foreign and Irish-owned assisted employment, except for foreign-owned jobs in the Mid-East. The South East (9.4%) and Dublin (7.2%) had strong growth in foreign-owned jobs with the Mid-East, Midlands and Border performing least well. For Irish-owned jobs, the Mid-West, West and Midlands performed strongly. In general there was less regional variation in the performance of Irish-owned assisted employment compared with foreign-owned. Irish-owned firms out-performed foreign-owned in all regions except the South East, Dublin and South West. Fig. 8: Percentage change in total agency-assisted employment in foreign-owned and Irish-owned firms in each region, 2016-2017. Source: DBEI, Annual Employment Survey 2017, Appendix B. The strong growth trend evident in agency-assisted employment for the past number of years continued in 2017. All regions had a greater number of agency-assisted jobs in 2017 than they had in 2008. There were considerable regional variations however, with the South West, Dublin and the West experiencing extremely strong jobs growth over the decade, substantially driven by foreign-owned companies, which led to their combined share of total assisted jobs increasing from 58.5% in 2008 to 63.5% in 2017. These three regions also have the highest shares of foreign-owned employment and two of them (West, Dublin) have the highest shares of Temporary/Part-time employment. While all other regions have also seen growth in the numbers working in agency-assisted firms, this has been at a substantially lower level. The Mid-East and Midlands actually have fewer jobs in foreign-owned assisted firms in 2017 than they had in 2008, though growth in Irish-owned assisted jobs compensated for this, leading to overall growth. The Border and Midlands show the highest shares of Irish-owned assisted employment and in the past year (2016-2017) Irish-owned firms out-performed foreign-owned in these two regions, as well as in the West, Mid-West and Mid-East. While the foreign-owned sector has been a strong driver of assisted employment growth, especially in the Dublin, South West and West regions and in the initial stages of the recovery, the Irish-owned sector has responded strongly in more recent years and shows a more even geographical spread. 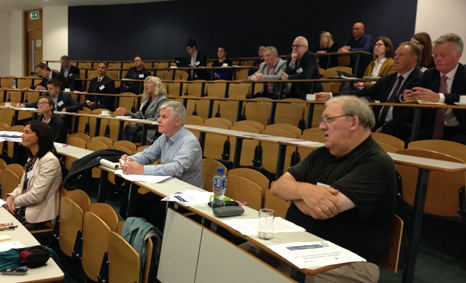 The Regional Studies Association Irish Branch Annual Conference was held in the Institute of Technology Sligo on Friday 7th September. Appropriate for the location, it had the theme “City Led Regional Development and Peripheral Regions”. The presentations are available here. The conference covered a range of themes relating to regional development and how urban areas interact with their rural regions. 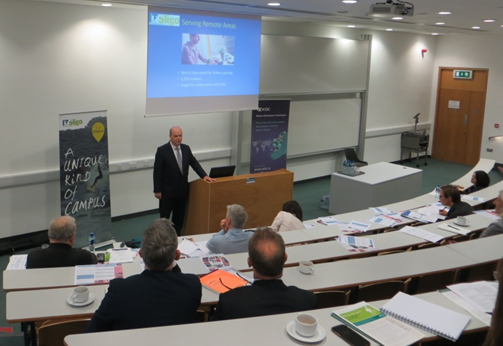 It was opened by Dr Chris O’Malley from Sligo IT who discussed the role of Sligo IT in the development of industry and manufacturing in the region and the IT’s role as an integrator of national policy at regional level. Dr Deirdre Garvey, chairperson of the Western Development Commission, welcomed delegates to the conference noting how pleased the WDC was to be sponsoring the Annual Conference. She also welcomed the fact that the conference was taking place in the North West, given the recognition in the National Planning Framework of the specific challenges for the region and how the National Planning Framework (NPF) and Regional Spatial and Economic Strategy (RSES) process highlight the distinct challenges and opportunities for our predominantly rural region. After coffee the session on Regional Strategy and Planning covered a broad range of topics. Louis Nuachi (DIT) presented on the importance of social and cultural objectives in town planning using a case study of planning in Abuja, the capital of Nigeria. David Minton, the CEO of the Northern and Western Regional Assembly (NWRA) discussed issues for the development of the North and West in the RSES, some of the historic development of the region and a number of the challenges in developing a region wide approach. Finally in that session, John Nugent (IDA) discussed the IDA role in attracting Foreign Direct Investment to the region and some of the important factors which influence the location of FDI, including the importance of having a strong indigenous sector already in place and the ways the indigenous and foreign sectors are mutually beneficial. After lunch international perspectives were provided by Dr Andrew Copus from the James Hutton Institute in Aberdeen and Professor Mark Partridge, the C. William Swank Chair of Rural-Urban Policy at The Ohio State University. 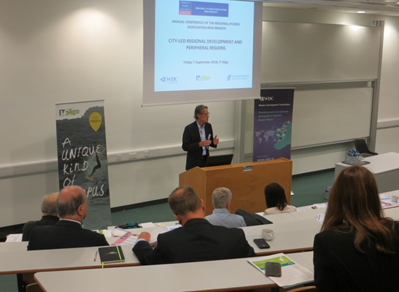 Dr Copus paper The Scottish City Region Deals – A rural development perspective noted that optimistic assumptions about how a wider functional region benefits from city investments, are commonplace and generally unquestioned, despite meagre evidence of such impacts. He discussed the two strands of ideas on policy for urban rural development that of polycentricity and rural urban co-operation (theories which are stronger in EU countries and in OECD work), and City Regions (which have tended to have more focus in the UK). He highlighted the importance of defining what is meant by rural when considering the impact of such regional policies and he discussed the development and implementation of regional policy by the Scottish and UK governments in Scotland. He noted that in general in these deals the dominant rationale relates more to “Smart Specialisation” than to any kind of urban rural cooperation, interaction or spread effect concept, but the way growth deals developing for rural areas of Scotland will fit into the Post Brexit rural development landscape remains to be seen. Prof. Mark Partridge’s paper Is there a future for Rural in an Urbanizing World and Should We Care? noted how rural areas have received increased attention with the rise of right-wing populist parties in Western countries, in which a strong part of their support is rural based. Thus, bridging this rural-urban economic divide takes on added importance in not only improving the individual livelihoods of rural residents but in increasing social cohesion. He discussed the background of rural and peripheral economic growth, noting the United States is a good place to examine these due its spatial heterogeneity. He showed that, contrary to public perceptions, in the US urban areas do not entirely dominate rural areas in terms of growth. Rural US counties with greater shares of knowledge workers grow faster than metro areas (even metros with knowledge workers). He had some clear suggestions for regional policy, noting that governance should shift from separate farm/rural/urban policies to a regional policy though a key issue is to get all actors to participate and believe their input is valued. In rural development it is important to leverage local social capital and networks to promote good governance and to treat all businesses alike and avoid “picking winners. Rural communities should be attractive to knowledge workers and commuters, while quality of life, pleasant environment, sustainable development; good public services such as schools are important to attract return migrants. Building local entrepreneurship is key too and business retention and expansion is better than tax incentives for outside investment. In the final session ‘Understanding Regional and Urban Dynamics’ I gave a presentation on what regional accounts can tell up about our regional economies and discussed some of the issues associated with the regional data and the widening of disparities among regions. Dr Chris Van Egeraat (Maynooth University) presented a paper, written with Dr Justin Doran (UCC) which used a similar method to Prof. Partridge to estimate trickle down effects of Irish Urban centres and how they influence the population in their wider regions. Finally Prof. Edgar Morgenroth (DCU) presented on the impacts of improvements in transport accessibility across Ireland highlighting some of the changes in accessibility over time and noted that despite these changes human capital is the most important factor influencing an area’s development. While the conference had smaller attendance than previous years there was good audience participation and discussion of the themes. The conference papers are now available on the WDC website here and will shortly be available on the RSA website. 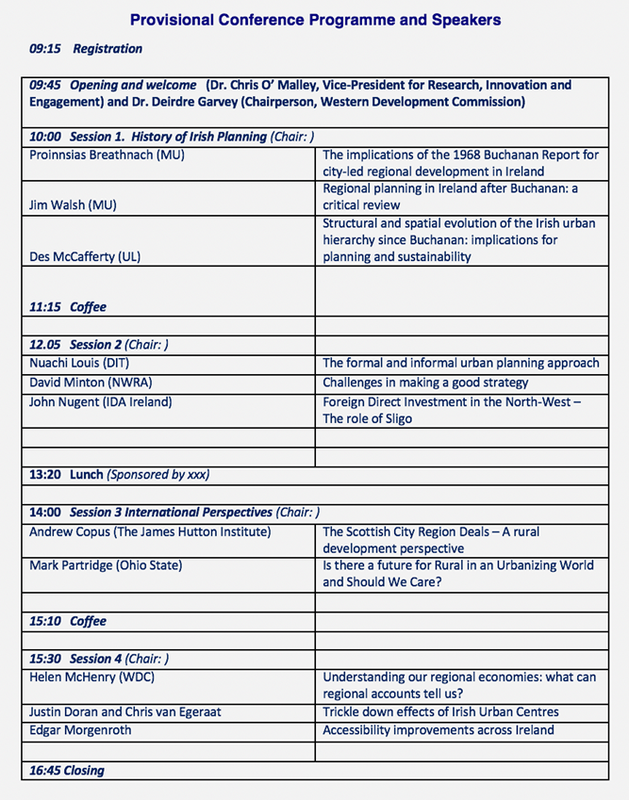 The theme of this year’s Regional Studies Association Irish Branch Annual Conference, to be held in the Institute of Technology Sligo on Friday 7th September, is “City Led Regional Development and Peripheral Regions”. The conference will examine how urban areas interact with their rural regions and whether the development of the city or urban area leads to wider development. Two international experts, Dr Andrew Copus from the James Hutton Institute in Aberdeen and Professor Mark Partridge, the C. William Swank Chair of Rural-Urban Policy at The Ohio State University, have been invited to present other countries’ experience on this theme and to stimulate debate about the reality of city led development. Andrew’s paper The Scottish City Region Deals – A rural development perspective. considers how urban-rural interaction is a long-established element of the “theory of change” associated with regional development policy. Optimistic assumptions about wider functional region benefits of city investments, are commonplace and generally unquestioned, despite meagre evidence of such impacts. A summary history of urban-rural concepts in the European policy discourse, will be followed by a brief account of rural/regional policy in Scotland. Against this background the origin and evolution of Scotland’s City Region Deals, and Regional Partnerships, will be described. The presentation will conclude with some reflections on the how these evolving arrangements fit into an already cluttered policy landscape, their compatibility with rural policy “mainstreaming”, and the likely benefits for rural Scotland. Mark’s paper Is there a future for Rural in an Urbanizing World and Should We Care? examines how rural areas have received increased attention with the rise of right-wing populist parties in Western countries, in which a strong part of their support is rural based. While the underlying reasons are complex and unique to each country, one common feature is that rural areas have typically faced recent economic decline, creating anxiety, and in some cases, anger of rural residents directed at their urban counterparts. Thus, bridging this rural-urban economic divide takes on added importance in not only improving the individual livelihoods of rural residents but in increasing social cohesion. One way to bridge this economic gap is to improve rural-urban economic linkages through an urban-led economic strategy. For example, urban growth can create commuting and market opportunities for rural residents and firms if there is sufficient connectivity. While such a process has strong theoretical advantages it also requires rural areas to more carefully think about quality of life to attract and retain residents who would otherwise relocate to urban areas. 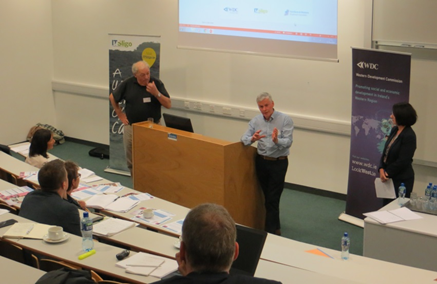 The issues in Ireland are examined in other presentations and it is to be hoped that the conference will provide useful input to the discussion about regional development in Ireland as the Regional Spatial and Economic Strategies of Project Ireland 2040 are drafted. The draft conference programme is below. https://www.wdc.ie/wp-content/uploads/Urban-graphic-.png 99 356 WDC https://www.wdc.ie/wp-content/uploads/wdc-567.png WDC2018-08-20 11:17:012018-08-20 11:17:01City Led Regional Development and Peripheral Regions- join the debate! While my previous post on county incomes (based on the CSO’s publications County Incomes and Regional GDP, 2015) considered the changes in Disposable Income over time, in this post I look at the components of Disposable Income, some of the changes in these since 2000, differences among Western Region counties and their impact on the changes in Disposable Income. The key component of Disposable Income is Total Household Income (which includes Primary Income and Social Transfers) and this is examined first. Total Household Income is the amount of income from available to the household from earnings, and Rent of Dwellings (imputed) and net Interest and Dividends, as well as ‘Social Benefits and Other Current Transfers’. Total Household Income grew steadily (Figure 1) in all counties between 2000 and 2008 (in Donegal there was a tiny decline between 2007 and 2008). In most counties it declined between 2008 and 2011 and then began to grow slowly. Despite this growth, preliminary figures show that by 2016 neither in the State nor any Western Region county had Total Household Income per person recovered to 2008 levels. In Roscommon, for example, it was €25,061 per person in 2008 and €21,522 in 2016 (a difference of €3,539) , while in contrast in Sligo it was €24,940 in 2008 and €24,818 in 2016 (a difference of only €122). Source: CSO, 2018, County Incomes and Regional GDP ; Estimates per person based on own calculations using inferred population estimates. 2016 figures are preliminary. Primary Income is the main component of Total Household Income and Figure 2 shows Primary Income as a percentage of Total Household Income over the period 2000-2016. It should noted that Total Household Income also includes Social Benefits and Other Current Transfers and is balanced by the Statistical Discrepancy (arising from different collection methods being used to estimate income and expenditure). Therefore that Total Household Income does not equal the sum of Primary Income & Social Transfers. Nonetheless, it is useful to see how the importance of Primary Income (and by inference social transfers) has been to Total Household Income. In 2000, in the State as a whole, Primary Income was 87% of Total Household Income. It was also 87% in Clare but as low as 80% in Donegal but by 2016 it was 81% in the State, 79% in Clare and 70% in Donegal, indicating the increased importance of social transfers. What is Primary Income made up of? Looking at the breakdown of Primary Income (Figure 3) in 2015, it is clear that the main component in all counties is wages and salaries (Compensation of Employees (i.e. Wages and Salaries, Benefits in kind, Employers’ social insurance contribution) which nationally makes up 77% of Primary Income. In the Western Region, Primary Income accounts for 77% in Sligo, 76% in Galway and 75% in Clare. It accounts for 74% of Primary Income in Donegal, Mayo and Leitrim while in Roscommon it is only 73%. Other elements of Primary Income are accounted for by Net Interest and Dividends (4% in the State and all Western Region counties), and Rent of Dwellings (imputed) which is between 8% and 10% in Western Region counties and 9% in the State. Income from self employment is the other main component of Primary Income, and this accounts for 14% of Primary Income in Roscommon and Leitrim, and 11% in Galway and 10% in Sligo and 10% in the State as a while. Income from self employment is more significant in all Western Region counties than the State as a whole. Alongside a decline in self employment shown in recent years there has been a significant decline in the proportion of Primary Income coming from self-employment (Figure 4). In the State it accounted for 16% of Primary Income in 2000 and was 10% by 2016. Western Region counties, though starting from a higher base, have followed a similar pattern. For example in Roscommon income from self-employment was 24% of Primary Income in 2000, but 13% in 2016. It is not clear why this decline has taken place, perhaps because of a decline in the numbers in farming, or perhaps because of poorer earnings from self-employment. Looking again at Total Household Income, it is interesting to examine the changes in social benefits (Figure 5) over time. With the growing economy in the early part of the century, the amount received in social benefits per person grew alongside the growth in Primary Income, peaking in most counties in 2009. After the downturn, however, there was a slow decline in the level of social transfer per person. This was during a period of significant in some of the social benefits, but high levels of unemployment kept the level of transfers per person quite high. The decline has continued, to 2016, presumably as the numbers claiming unemployment benefit and assistance has decreased. Much of the discussion above has related to the components of Total Household Income, but in order to get to a figure for Disposable Income taxation has to be taken into account. As would have been expected (see Figure 6), in line with growth in incomes between 2000 and 2007 taxes on income (per person) also grew to 2007. With pay cuts and job losses, there was a sharp decline between 2007 and 2010 but then then taxation on income grew again to 2016. It is likely that in the first few years this related to increases in tax levied, and then in more recent years the growth has probably come from the increase in the numbers employed and paying tax. While I have looked at changes in taxation and social benefits estimated on a per capita basis from 2000 to 2016 it is also interesting to see a direct comparison of the two for each county in 2015. Figure 7 shows social benefits and taxation as a percentage of Total Household Income (as noted above, these percentages should be used to compare the differences amount the Western Region counties, rather than as absolute proportions, as they do not take account of the effect of the statistical discrepancy). Nonetheless it is useful to compare the different levels of taxation on income and social transfers among the counties. Higher numbers of people in non-working categories (children, older people and people with disabilities) influences both the amount of tax paid and the level of social transfers received. For a more detailed discussion of the levelling effects of the redistributive tax and transfer system (as relates to income inequality rather than regional inequality) see this paper from the ESRI. Source: CSO, 2018, County Incomes and Regional GDP; own calculations. In the State as a whole taxation (24%) is a higher proportion of Total Household Income than Social Benefits (20%), and this is also the case in Galway and Clare. In the five other Western Region counties social benefits are a higher proportion of Total Household Income than taxation. This is most evidently the case in Donegal with taxation 18% and social benefits 31% of Total Household Income in the county. Finally, given that this post has examined the various components of disposable incomes Figure 8 gives an overview of the different broad income components in Western Region counties in 2015. As discussed above, Primary Income is largely made up of earned income (and imputed rent and net interest and dividends), while Total Household Income also includes social benefits. Taxes are deducted from Total Household Income to give Disposable Income per person. Source: CSO, 2018, County Incomes and Regional GDP ; Estimates per person based on own calculations using inferred population estimates. Disposable Income, the key ‘county income’ measure, is made up of different sources of income and transfers and is also affected by taxation, therefore it is valuable to understand the changes in each of these components in the different counties when considering changes to income. The Western Development Commission (WDC) has just published two WDC Insights: How are we doing? County Incomes in the Western Region and What’s happening in our regional economies? Growth and Change in Regional GVA. Both of these examine data from the most recent CSO County Incomes and Regional GDP publication for 2015 (with preliminary data for 2016) and they have a particular emphasis on the counties of the Western Region and on our regional economy. These two page WDC Insights publications provide succinct analysis and commentary on recently published data and on policy issues for the Western Region. Both of these WDC Insights are shorter versions of the series of blog posts on County Incomes and Regional GVA which you may have read previously. In this WDC Insights data on County Incomes in 2015 are examined with a focus on the difference among Western Region counties and changes over time. Five Western Region counties had Household Disposable Income per Person (Disposable Income) of less than 90% of the state average, while Galway and Sligo were both 93%. They had the highest Disposable Incomes in the Western Region in 2015 (Galway (€18,991) and Sligo (€19,001)). Donegal continues to have a significantly lower Disposable Income than any other county in Ireland (€15,705 in 2015). Disposable Income in Roscommon was also significantly lower than the state average at €16,582 in 2015. This was the second lowest of any county in Ireland, while Mayo had the fourth lowest. Regional divergence was at its least in 2010 when all parts of the country were significantly affected by recession. Since then, incomes in some counties have begun to grow faster and divergence has again increased, particularly since 2012. Between 2014 and 2015 there was very significant growth in GVA and GDP nationally (a level shift which occurred for a variety of reasons). It is therefore valuable to examine how this rapid economic growth was spread among regions. While data for the largest regions of Dublin and the South West has been suppressed by the CSO, to preserve the confidentiality, variation in growth and disparity in the other regions continues to be of national and regional importance. The data shows that disparities are widening and economic activity, as measured by GVA, is becoming more and more concentrated. The smaller contribution to national GVA from other regions highlights their significant untapped potential. I hope that you find these WDC Insights useful. Let us know what you think. We’d welcome your feedback. Other contributions dealing with the topic of regional studies are invited and may be included in focussed sessions. Dr Andrew Copus, The James Hutton Institute, Scotland: Andrew Copus joined the Social, Economic and Geographical Sciences Group of The James Hutton Institute in March 2013. For the previous eight years he was a Senior Research Fellow at Nordregio (Nordic Centre for Spatial Development, Stockholm) and the Centre for Remote and Rural Studies, University of the Highlands and Islands. Andrew is an economic geographer by training, whose research interests relate to the changing rural economy and rural/regional policy. Much of his work has been based upon analysis of small area or regional secondary data and indicators. He has a long-standing interest in territorial rural development and regional disparities, which through recent projects is presented as “rural cohesion policy”. Much of Andrew’s work has had a European perspective, variously funded by Framework Programmes, ESPON and as a consultant for the European Commission. He has studied the role of rural business networks, the changing nature of peripherality and most recently, patterns and trends in poverty and social exclusion. Dr. Partridge’s current research interests include investigating regional economic growth, urban spillovers on rural economies, why regions grow at different rates, and spatial differences in income equality and poverty. Dr. Partridge has consulted with OECD, Federal Reserve Bank of Cleveland, and various governments in the U.S. and Canada, as well as with the European Commission. He has presented to the U.S. Congress and the Canadian Parliament on regional issues. In the last blog post on this subject, Leprechauns in Invisible Regions, the very significant changes in GVA and GDP at a regional level between 2014 and 2015 were discussed. These largely applied in manufacturing, with a national growth in GVA that sector of 134%. As mentioned in that post, some regional data for the NUTS3 regions of Dublin and the South West was suppressed by the CSO to preserve confidentiality. The focus of this post, therefore, is on changes in other NUTS 3 regions. Of course Dublin and the South West are the largest economic regions but it is useful to consider the changing situation in regions less affected by the level shift in GVA in 2015 (and not affected by the confidentiality issue), and to examine in more detail the other GVA data published by the CSO in its annual County Incomes and Regional GDP publication. The change in GVA per person between 2014 and 2015 is shown in Figure 1. Growth in the State as a whole (which includes the South West and Dublin regions) was most significant (37%), but there was a 30% increase in GVA per person in the Mid West region and a 30% increase in the South East region. Growth in GVA in those years was more modest in the Midland region (17%) and the West region (9%), while it was only 5% in the Border region. Looking at changes over a longer period Figure 2 shows GVA per person in the NUTS 3 regions since 2007. GVA per person was significantly higher in the Dublin and South West regions between 2007 and 2014. There has been some change in relativities among regions since 2007 with the Midland region, which had lowest GVA per person in 2007, higher than the Border region in 2015 (22,320 in the Midland region compared to 19,060 per person in the Border region in 2015). GVA in the West grew more rapidly than elsewhere in 2011 and 2012 but since that period GVA in the West has again fallen behind that in the Mid East and the South East and the gap between them has widened. As has been discussed, some of the regions showed very significant growth between 2014 and 2015 but, as can be seen in Figure 2, there was no significant increase in GVA between 2015 and 2016 in any region for which data is available. An index of how GVA in the regions compared to that in the State between 2007 and 2016 (Figure 3) gives a useful picture of widening regional disparity. None of the regions for which data is available were above the State average during that period. The Border region had an index of only 36.3 in 2015. In that year the Midland region was only 42.5% of the State while the West was 56.0. In contrast in 2007 the Border index was 68.1, the Midland index was 65.5, and the West was 71.3. The Mid West, which had consistently highest index of GVA for regions where data was available, was 72.6% of the State average in 2016. All of the regions for which data is available have lower indices of GVA relative to the State in 2016 compared to 2007. For example, the West was 71.3 in 2007 and 56.0 in 2016, and the Border was 68.1 in 2007 and 37.1 in 2016. This indicates the very significant widening of disparities in GVA between these regions and GVA in the State which is influenced by the more rapidly growing Dublin and South West regions. It is also interesting to look at changes in GVA over time relative to an index of regional GVA in the EU. This shows how Irish regions are faring compared to the rest of the EU. It is also important as the relative size of regional GVA per person impacts on the level and type of EU structure funding available to a region. Regions where GDP per capita is less than 75% of the EU average are designated ‘convergence regions’ (86 regions between 2014 and 2020) and those with GDP per capita above 75% of the EU average are seen as developed regions (186 NUTS 2 regions). Looking at the NUTS 2 regions in Ireland the changes relative to the EU average are very stark, particularly since 2015 (Figure 4). In 2007 the S&E region was 163.8% of the EU average and it declined to 144.2% in 2009, there followed by steady grown to 2014, when it reached 153.2%, still below that in 2007. The level shift in GVA in 2015 meant the S&E region increased dramatically to 213% of the EU average in 2015. In contrast in 2007 GVA in the BMW region was at the EU average (100.9) but it declined relative to the EU average until 2014 (77.1%) with only slow growth for 2015 and 2016 (it is estimated at 80.1% of the EU average in 2016), compared to 213% in the S&E region. There is more fluctuation in GVA relative to the EU28 when we look at NUTS 3 regions (Figure 5). Even without data for the regions with the highest GVA (Dublin and the South West) the other regions in the S&E NUTS 2 region have all had higher GVA than the EU average since 2014. The Mid West region consistently had GVA higher than the EU average since 2007, despite some decline, while the South East and the Mid East were below the EU average between 2009 and 2014). In contrast, the three regions which make up the BMW were all at or below the EU average in 2015 and 2016, and the Border and Midland regions have never been above the EU 28 average. The Border is currently only 65.7% of the EU average (2016) while the Midlands is 76.2%. GVA in the West region has shown significant fluctuation, and was particularly strong in 2011 and 2012 (peaking at 108.8% of the EU average) but has since fallen back, though it is currently very close to the EU average (99.2%). It is also interesting to look at changes in productivity in recent years (Figure 6). There was a dramatic increase of 42% in productivity (GVA per person at work) in the State between 2014 and 2016 (this includes the figures for the South West and Dublin regions), and there were also significant increases in the Mid East (38%), Mid West (34%) and South East (40%) regions. While increases in productivity were much smaller in the Border (9%), Midland (20%) and West (15%) all regions did show productivity growth. Regional Productivity is dependent on a number of factors, including the types of economic activities being undertaken in the regions so it is useful to look more closely at the data for this. There is significant variation in the importance of different sectors in each region (Figure 7). Looking at Industry, for example, the West region has the highest proportion of GVA from this sector (of the regions for which data is available) at 41.5% compared to 38.8% for the State as a whole. There is substantial variation in the contribution of Professional, Scientific and Technical services to GVA (13.6% in the Mid East region and 13.4% in the South East compared to 5.3% in the Midland region and 6.2% in West region). Public Administration and Defence makes a very significant contribution to GVA in the Border (27.9%) and Midland region (26.8%) but only accounts for 11.9% of GVA in the State as a whole. The relative importance of the three main branches of economic activity in the Border, Midland and West Regions is shown in Figure 8. Manufacturing, Building and Construction accounts for almost half (46%) of GVA in the West region but only 24% in the Border and 32% in the Midland regions. In contrast services account for 65% of the Midland GVA, and 73% of GVA in the Border region and 52% in the West region. For the State as a whole Manufacturing, Building and Construction accounts for 41% of GVA and Services account for 58%. Looking at changes in GVA between 2014 and 2015 for each branch of the economy and, as would have been expected, there were significant changes in GVA from Manufacturing, Building and Construction in most regions between 2014 and 2015, with a 105% increase in the State, a 76 % increase in the South East, and a 75 % increase in the Mid West. In the West, however the increase in GVA in this branch was only 20% and again, very significantly (and giving rise to the low growth in GVA) in the Border it was only 3%. There were also changes of note in the Agriculture, Forestry and Fishing sector (which accounts for a relatively small amount of GVA). There was a decrease in GVA from this sector of 7% in the State between 2014 and 2015 and a significant decrease of more than 20% in the South West and 14% in the Border region and the Mid West region. GVA from services grew in all regions, but only by 1% in the West region (compared to 11% in the State). While there are difficulties with using GVA and GDP as measures of regional development (see here and here) it is nonetheless a very important indicator of regional economic activity and essential to our understanding of the changes taking place in Irish regions. However, in order to understand regional growth and change it is important to use GVA in combination with other data such as that on employment, enterprise activity, income, wealth and consumption. GDP is Gross Domestic Product, GDP and GVA are the same concept i.e. they measure the value of the goods and services (or part thereof) which are produced within a region or country. GDP is valued at market prices and hence includes taxes charged and excludes the value of subsidies provided. GVA at basic prices on the other hand excludes product taxes and includes product subsidies. See background notes . In previous posts on GVA the Mid East has been considered with Dublin (see this post for example) as much of the GVA in the Dublin region is produced by commuters from the Mid East (and other regions) and GVA per person for the Dublin region does not reflect this. However, as data for the Dublin region is not available Mid East data is included here. https://www.wdc.ie/wp-content/uploads/work-in-west-rectangle-2.png 207 600 WDC https://www.wdc.ie/wp-content/uploads/wdc-567.png WDC2018-04-30 11:36:222018-04-30 11:36:22What’s happening in our regional economies? Growth and change in Regional GVA.